It is correctly configured to point to my network (http://artomultiplo.net) but I don't know why, when I try to map it it always give me error... so I can't map it. I'm not able to even access your Domain Mapping settings on your network admin dashboard, I'm getting an NGINX 502 Bad Gateway error. Is this the error you're seeing? Have you seen it since you installed Domain Mapping, or is it new? Were you able to access that settings page at all? If you're working on your site, and that's why the bad gateway is showing up, let us know when you're finished and we can hop back in. I'm not working on it. And I'm not touching anything at all. 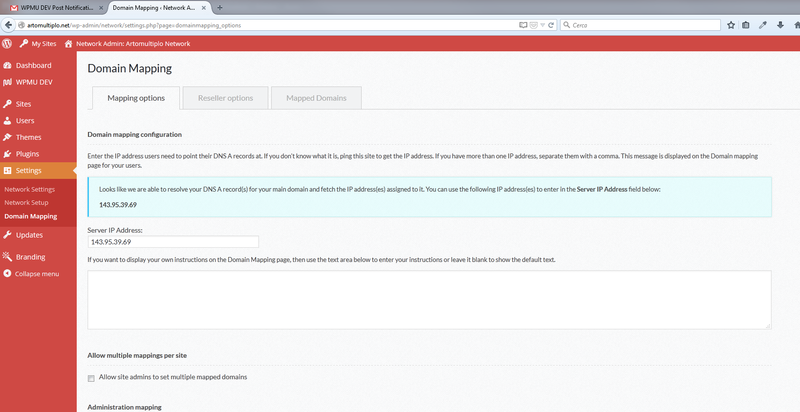 I can also see the domain mapping admin pane. Any updates regarding this issue... Is really important for me so I can come back to work. Thanks @Jude, I'll be doing this as soon as possible. Thanks for your amazing support and commitment to help me fix this.